Edward Daniels was an agent for the State Kansas Aid Society of Wisconsin. 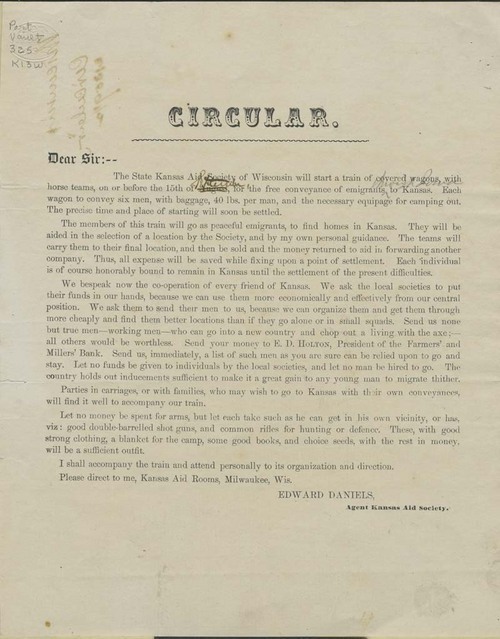 This undated printed circular encouraged the donation of funds to aid emigration to Kansas or the commitment of men to go to Kansas Territory as peaceful settlers. The circular stated that a train of wagons, with six men per wagon, would leave Wisconsin on or before September 15 of an unspecified year. It suggested that emigrants bring double-barrelled shot guns and rifles as well as clothing a blanket, good books, and seeds, with additional money for other equipment. The primary reference to the controversy in Kansas Territory was "each individual is of course honorably bound to remain in Kansas until the settlement of the present difficulties." The document refers to local societies as well at the state society.